That said, we have built integrations for the two most popular: Angular and ReactJS. We welcome your suggestions for which we should look at next. 2. What’s the difference between React and Angular? Often developers will compare ReactJS with Angular (or, perhaps Angular 2 – the much-overhauled new version released this year) but the two are quite different. Angular can be more accurately described as a framework. It offers more out-of-the-box, and requires the developer to take fewer decisions when getting started. Importantly, it also provides a complete framework for your app. ReactJS is a library, designed only for the view layer of your application. Compared to Angular, it will require you to take a few extra design decisions at the beginning. You will need to find additional libraries to control other bits of functionality outside the view, like routing and API calls, but this allows the developer greater control. Also, ReactJS provides an efficient way to modularize your app, and provides a virtual DOM, making updates easier and improving performance. There are plenty of in-depth comparisons on the web: this one does a nice job of summarizing the differences. 3. What are the benefits of using ReactJS for my KeyLines applications? KeyLines does not require you to use any 3rd party frameworks or libraries. We would only recommend using this integration if you plan to use the ReactJS library for your application anyway. That said, the correct use of ReactJS can make the life of a developer easier. ReactJS’ own documentation does a better job of explaining this than we could. 4. What are the dependencies? If you have a preference about the 3rd party libraries you use, they can be easily swapped out or removed. Remove the import statements at the top of the react-keylines.js file, and the export statements at the bottom. If you do this, don’t forget to include react.js and react-dom.js manually. 5. How do I use ReactJS with KeyLines? First, login into the KeyLines SDK website and navigate to the ReactJS demo. It’s a simple use case – using only layouts and selection – but should help you find your way around the KeyLines / ReactJS structure. When you download our React integration, you will find that we have included a <Chart> component which can easily be added into your JSX. We tried to make sensible assumptions with this component, but feel free to adapt it to your own tastes. We have written the code in ES2015, using new features such as ‘arrow functions’ and we also declare the component as a module so that you can easily import it into your own code. More thorough instructions can be found in the KeyLines SDK website. Take a look, try it out and let us know how you get on! 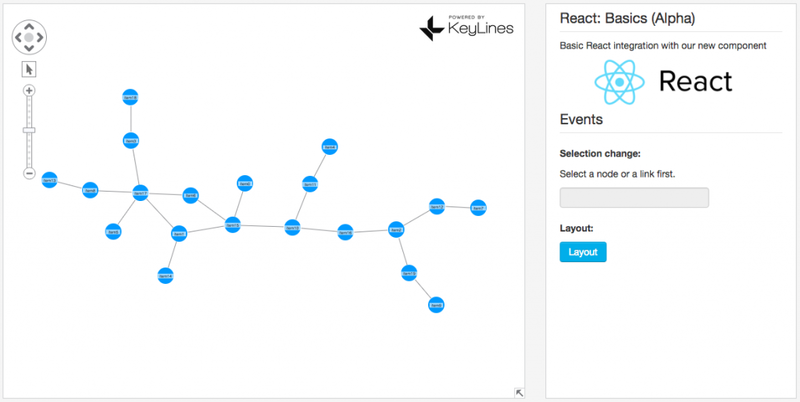 KeyLines is a powerful technology for building graph visualization applications. If you want to try it out we’d be happy to help. Complete the form at the bottom of this page to get started with a free trial.